In Photoshop Elements, you may have an occasional need to add text to an image: a caption, a headline, or maybe even a short paragraph. Elements provides ample tools for creating, editing, stylizing, and even distorting type. You can enter text in Elements in two different modes: point type and paragraph type. Point: Use this mode if you want to enter only a few words or so. To create point type, select the Type tool, click in your image, and, well, type. The text appears while you type and continues to grow. In fact, it even continues past the boundary of your image! Remember that point type never wraps around to a new line. To wrap to the next line, you must press Enter (Return on a Mac). Paragraph: Use this mode to enter longer chunks (or constrained blocks) of text on an image. 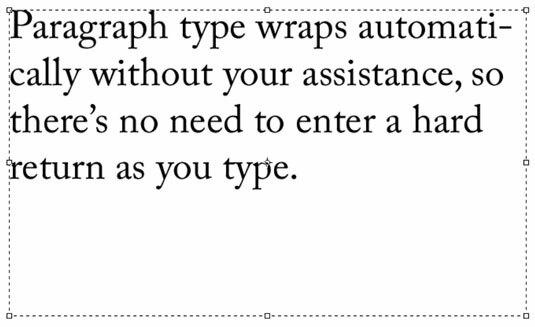 To create paragraph type, click and drag your type tool to create a text bounding box, and then type. All the text is entered in this resizable bounding box. If a line of text is too long, Elements automatically wraps it around to the next line. The majority of your type entry will most likely be in point type mode. Point type is useful for short chunks of text, such as headlines, labels, logos, and headings for Web pages. Point type is so called because it contains a single anchor point, which marks the starting point of the line of the type. Point type doesn’t wrap automatically, and can run off the edge of your image. Open the Editor and choose Edit Full mode. Open an image or create a new, blank Elements file (File→New). Select the Type tool from the Tools panel. You can also press the T key. On the image, click where you want to insert your text. Your cursor is called an I-beam. When you click, you make an insertion point. A small, horizontal line about one-third of the way up the I-beam shows the baseline (the line on which the text sits) for horizontal type. Specify your type options from the Options bar. Type tool settings on the Options bar. Type your text and press Enter (Return on a Mac) to begin a new line. When you press Enter (or Return), you insert a hard return that doesn’t move. When you finish entering the text, click the Commit button (the check mark icon) on the Options bar. You can also commit the type by pressing Enter on the numeric keypad or by clicking any other tool on the Tools panel. A new type layer with your text is created. Type layers appear on your Layers panel and are indicated by the T icon. If you have larger chunks of text, it’s usually more practical to enter the text as paragraph type. Entering paragraph type is similar to entering text in a word-processing or page-layout program, except that text is contained inside a bounding box. When you type and come to the end of the bounding box, Elements automatically wraps the text to the next line. Open an image or create a new, blank Elements file. Select the Type tool from the Tools panel or press the T key. Drag to create a bounding box close to your desired size. After you release the mouse button, you can drag any of the handles at the corners and sides of the box to resize the box. Hold down the Alt (Option on the Mac) key and click the image. The Paragraph Text Size dialog box appears. Enter the exact dimensions of your desired bounding box. When you click OK, your specified box appears, complete with handles for resizing later. Enter your text; to start a new paragraph, press Enter (Return on a Mac). Each line wraps around to fit inside the bounding box. If you type more text than can squeeze into the text box, an overflow icon appears. Just resize the text box by dragging a bounding box handle. Click the Commit button (the check mark icon) on the Options bar or press Enter on the numeric keypad. Elements creates a new type layer. Paragraph type automatically wraps to fit within your bounding box.